Lancôme has launched La Vie Est Belle L'Eau de Toilette Florale. The new fragrance for women is a flanker to 2012's La Vie Est Belle Eau de Parfum. La vie est belle L Eau de Toilette Florale, offers a brand new vision of the exceptional bottle, designed by Catherine Krunas. Its crystal smile is seen in more profound, radiant form than ever, taking flight with delicate fragility. Its new, pared-down lines are magnified with an iridescent white organza ribbon with sheer airy petals paying tribute to the floral fragrance, forming two ethereal wings on its joyful silhouette, like symbols of freedom. Fresh and luminous, its rosé elixir adds to the elegance of this concentrate of happiness. La Vie Est Belle L'Eau de Toilette Florale introduces a new "floral delicacy" based on osmanthus; additional notes include bergamot, pink pepper, pear, blackcurrant bud, jasmine, orange blossom, rose, magnolia, mimosa, violet, iris, patchouli and musk. 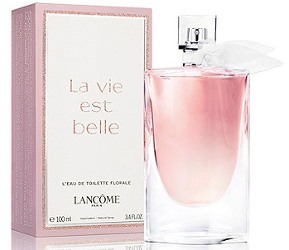 Lancôme La Vie Est Belle L'Eau de Toilette Florale is available now at Debenhams in the UK, in 50 and 100 ml. The original La Vie Est Belle just leaves me cold for some reason. I don’t have high hopes for this one…. It is not a favorite of mine either, but I have not tried any of the new concentrations / flankers. Hope it is good! I do like osmanthus.